You are shopping along, about to buy a Dremel. All of those TV ads have you convinced. It’s time to get one of these fantastic, multi-function tools. But, wait! Right before you checkout, the e-commerce site suggests that you look at this tool called a “Rotozip.” And it seems pretty cool — possibly better than the Dremel! Which one should you spend your money on? Well, it depends entirely on what your intended purpose is. 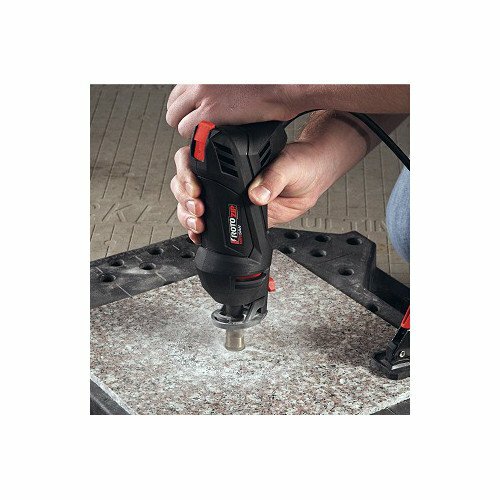 The Dremel is a great, all-around tool for grinding, cutting, carving and polishing. It is better at working in the tiny places (like behind your bathroom toilet) than the larger Rotozip is. The Rotozip is an even more robust, contractor-grade tool designed specifically for cutting sheetrock and ceramic. It is rugged enough to withstand daily use in a professional capacity. Rotary tools spin their bits like a drill. Oscillating tools move their bit back and forth like a saw. Ok, that’s overly simplistic. This is a key distinction between the Dremel and the Rotozip. 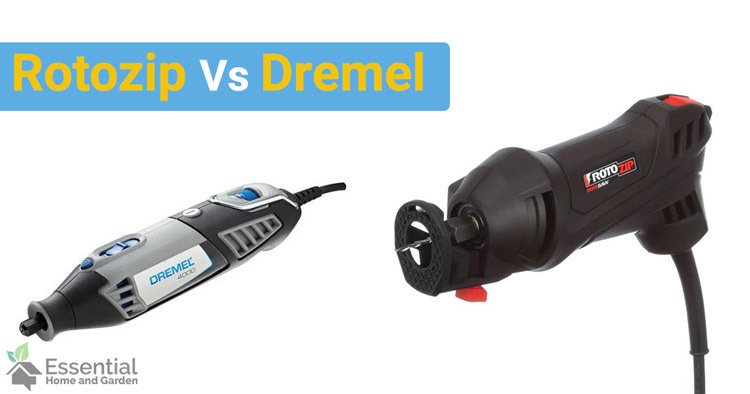 The Dremel uses a spinning motion which is great for jobs such as grout cleaning or for removing burrs from a hole that isn’t quite big enough. The Dremel Ultra-Max saw also uses a rotary motion. The only exception is the Dremel Multi-max, which in some ways, makes the Multi-max the closest Dremel tool to the Rotozip. The Rotozip was designed to be a drywall saw. Accordingly, the “blade” moves up and down in an oscillating motion. Far from a one-trick tool, it is excellent at sawing construction materials. 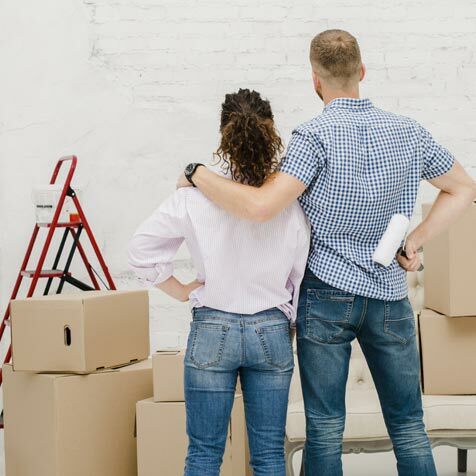 If we haven’t made it easy for you to make your buying choice yet, then let me break down the handling and features a little more and give you some real-world examples. If we miss your scenario, leave a comment and I’ll try to get you my best opinion. You’ll notice right away that the Rotozip is about three times larger than something like the Dremel 3000. When you look into reviews on the Dremel, you’ll always see folks highlighting how comfortable it is to hold with words like “360-degree comfort grip”. Dremel is a tool that is mostly marketed for consumer use. Unlike the Rotozip, Dremels are typically held like an oversized pencil. The Rotozip, by comparison, is held in the palm of your hand. It’s a comfortable grip, but you don’t see sites pontificating about comfort because the contractors who use it are here to get the job done — not worry about how soft their hands are at the end of the day. I think one thing that jumps out is the power difference between these two devices. The Dremel 4000 comes with a 1.6 amp motor. That’s the “Big size.” As Zachary Drumm from ToolTally.com says, it “packs the power of a small blender”. But if the Dremel is the small blender you used in college, the Rotozip will need to be compared to a Blendtec blender used in commercial kitchens. The Rotozip SS355-20 starts off with a 5.5 amp motor and is available in the SS355-10 version with a more substantial 6 amp motor and improved handle design. When shopping online it’s hard to see the difference, but in person it is obvious. The Dremel is just over 1 pound while the Rotosaw is heavier at over 3 pounds. 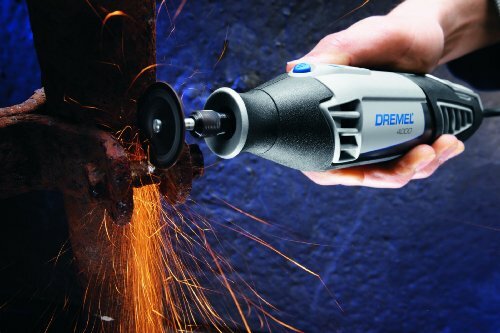 The Dremel rotary tool is like a mini angle grinder. It is not the best at bigger cutting jobs. I once used one to cut a frozen bolt off of a catalytic converter when no other tool would fit in there. It took me about 15 minutes to cut through a 1/4″ bolt, and I used up the bit in the process. Granted, it would do better with something like sheetrock, but for sheetrock, you are probably better off looking at something like the Ultra-Saw. With a tiny saw blade, the Ultra-Saw is miniature circular saws and is pretty famous for cutting squares in sheetrock and floors. Small circular saws like this one are handy for installing things like outlet boxes and HVAC vents. Between these two devices is the Dremel Multi-max. The Multi-Max can cut wood and sheetrock faster than the rotary Dremel line (but less efficiently than the Ultra-Saw). It can also cut off wood screws or sand wood for refinishing. All of these tools paled when it compared to the Rotozip’s dedicated cutting ability. It has an entire line-up of cutting bits from which to choose. When you select the correct bit, the tool is virtually unstoppable. With the Rotozip you are getting a mini, handheld router. This router ability gives you 360-degree cutting ability. While the Dremel Rotary tools come closest to this benefit, the Rotozip is going to cut plywood and sheetrock much faster than the Dremel can. It also has a dust vault to minimize flying dust, making it a safer tool to use (FYI breathing construction dust is quite hazardous to the lungs). Sheetrock workers will make comparisons between the Rotozip and the manual keyhole saws that they use on every job. The Rotozip is a faster version of that keyhole saw, but the uses could be similar. It is also ruggedized against the dusty work environment. Dremels are smaller and get very hot, so they emphasize ventilation. Unfortunately, that makes them susceptible to not holding up when working in extremely dusty environments. The 360-degree skill makes this one of the handiest circle-cutting machines. You poke a hole with it, and then insert a jig into the center hole. The jig acts as a guide to create a perfect circle for you. But it doesn’t stop with light-weight materials. You can use it to cut cement backer board and even tile. This added ruggedness is extremely handy for home remodels for those scenarios where you need to cut a tile to go around existing water lines or create holes in the backer board for your shower install. If the ability to cut ceramic tile isn’t impressive enough, you also have the granite bit for cutting granite. Installing a granite countertop and need to cut a hole for the sink’s sprayer nozzle? With the Rotozip, you can make that happen. And, not to be outdone by the Dremel, it has an x-bit Spiral that can cut up to 18-gauge steel (1/20-inch or about .05″ thick). Sanding and grinding is where the Dremel shines. They try to make their tools as versatile as possible since they are selling them to consumers who can’t afford to have a wide array of dedicated devices for each task. For big jobs (like sanding furniture), the Dremel Multi-Max is going to be your ideal choice. The Rotozip is solely a cutting tool, making it a poor choice for this. 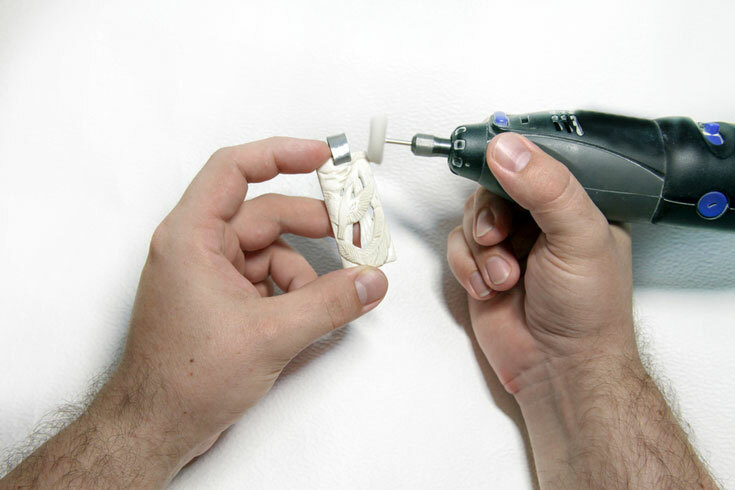 Just like the Dremel, there are some added accessories that you can get for the Rotozip. The first one that I love is the grout removal kit. This jig helps to keep the tool flush with the tile and steel pins ride the space between the tiles to keep it straight while you zip it along and remove grout. Grout removal is always such a tedious task, and while you could technically remove it with a Dremel, the Rotozip is so much faster. One caveat: is that, based on my research, this adapter is a little harder to find (not available on dealer site, but is still at some e-commerce sites such as eBay). The Direct Drive attachment is another excellent upgrade for plumbers and those who need an angle grinder. 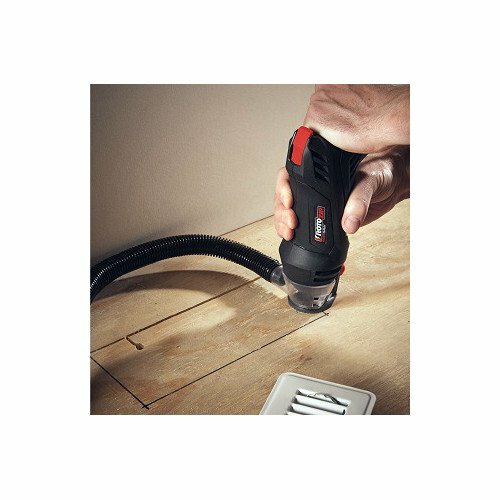 Attaching this adapter turns the tool into a mini cut-off grinder. With 2.5 cut-off wheels that spin at 30,000 RPMs, this adapter brings some added flexibility for plumbers and electricians. Are Dremel Bits Compatible With The Rotozip? The tools have different motions, and the Dremel bits aren’t likely to work well with the Rotozip. There is some overlap in their bit sizing, though. The Dremel uses bits from 1/8 inch down to a tiny 1/32 inch. The Rotozip can use 1/8″, 5/32″ and 1/4″ bits. In theory, you could do some interchanging, but the practicality of this is likely limited. If you need the ability to grind, cut and polish small items, the Dremel 3000 or 4000 is an excellent choice. If you need the ability to do a lot of straight cuts in wood and sheetrock, the Dremel Ultramax could be a good choice. If you need to do the more limited cutting of wood and sheetrock and also want to be able to do a lot of sanding, the Multi-Max would be your ideal choice. For all-day use in creating access points and outlet holes in sheetrock, plywood, tile, and granite, the Rotozip is the unmatched choice. The Worx Aerocart Review – Should You Buy It?